Brian Abery and Renáta Tichá in Moscow in 2015. 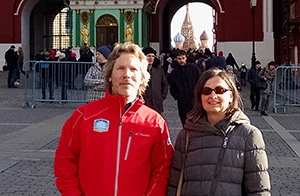 Brian Abery and Renáta Tichá (pictured in Moscow during a previous trip) from the Global Resource Center for Inclusive Education (GRC) at the Institute on Community Integration have launched a project known as Community Participation and Employment as Strategies for Social inclusion: A U.S.-Russian Dialogue. The project aims to enhance the social inclusion of youth and young adults with disabilities by developing community living and supported employment programs in the Moscow area. Funded by a one-year, $29,000 grant that began on June 22 from the Eurasia Foundation’s U.S.-Russian Federation Social Expertise Exchange Program, Tichá and Abery will work with a Russian nongovernmental organization called Journey Through Life to develop materials that support youth with disabilities to successfully transition from school to employment and community living. Activities will include staff from Journey Through Life visiting Minnesota for a 10-day period this fall to observe employment and community living programs, and GRC staff will travel to Russia to provide technical assistance to their partnering organization.